Assist children in expressing their creativity while helping wildlife with these Woodlink Classic Bluebird House DIY Craft Kits. Bluebirds readily use manmade housing for their nesting sites, and this package of 6 wooden units wonderfully meets their roosting needs. Each kit contains several precut wood panels, along with hardware and instructions, for building a bluebird house easily. The frames may be painted and included stickers affixed for customizing each piece, and helping spark your scouting group's interest in the natural world. An informational pamphlet about bluebirds offers tips on the placement of each home, and the units assemble using only a screwdriver. The 1.5" diameter, front entry hole on each is perfectly sized for bluebirds, and the overhanging roof protects the nest from the elements. Predrilled holes on the flat back of the homes allow you to mount them to a post or wall, and the front panels lift upward for seasonal nest checks. The thick, wooden construction helps regulate the interior temperature of each home, while forming a truly versatile and wonderful domicile. Foster bluebird populations and a love of birding in your youth group with these Classic Bluebird House DIY Craft Kits. Assembly required. Made in the USA. 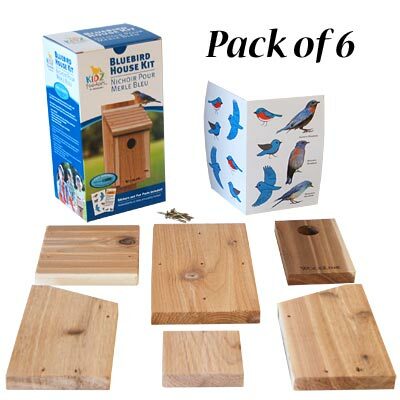 Note: This club package contains 6 of the Woodlink Classic Bluebird House DIY Craft Kits.